We got our first real taste of Android 3.0 -- "Honeycomb" -- on the Motorola Xoom tablet during CES in early January. It's a pretty big leap from the Android we know and love today, to be sure. But most of what we saw were demonstrations, video of what Honeycomb can and will do. But today Google released a preview of the Android 3.0 software development kit -- the tools developers need to make applications. Along with the updated SDK, Google's compiled an excellent highlights package. Join us after the break where we'll walk you through the some of the major changes, and what we can expect in the coming year. Ed. Note: Remember that this is based off a preview of Android 3.0, and things are very likely to change. We'll update when warranted. There's been a little back and forth about this, but make no mistake -- Honeycomb is intended for Android tablets. One look at the user interface (UI), and that's plenty apparent. But it's also going to make its way onto smartphones. Matias Duarte -- the UI guru behind webOS who later left for Google -- said as much during a recent interview. Android 3.0 is a new version of the Android platform that is specifically optimized for devices with larger screen sizes, particularly tablets. Does that mean your lowly 3.5- or even 4-inch phone won't be getting Honeycomb? Look at it this way: Anything you're holding in your hand as you read this (save for a Nexus S) is waiting on an upgrade to Android 2.3 Gingerbread -- and a good number of us are still waiting on Froyo for our phones. Point is, when it comes to smartphones "with larger screen sizes," we're not expecting Honeycomb upgrades anytime soon, except maybe for the Nexus S. New hardware later this year is a whole 'nother matter, though. Fear not, multiple home screens haven't gone anywhere. You still have five of them on which to place app icons, shortcuts and widgets. You'll be customizing everything through a "dedicated visual layout mode." Somewhere, someone at Microsoft is going to go a little nuts over this. But Honeycomb has a "System Bar" that's docked at the bottom of the screen. With it you'll have your notifications (moved from the top of Android 2.3 and previous), system status, a clock and soft navigation buttons. When you're running an app -- say, like gmail -- you'll have an "Action Bar" at the top of the screen. That's another UI element that's very much in line with what you'll find on a desktop computer program -- or Windows Mobile, for those who can stand to think of it. Hey, multitasking isn't going anywhere. And we're getting a new way to switch from one app to another. There will be a "Recent Apps" list tucked into the System Bar. The list will show you a thumbnail of the app -- in the state that you last left the app. Yes. This sounds very much like desktop computing to us, too. Makes sense. As anyone who's used the Samsung Galaxy Tab or some other Android tablet can attest, simply scaling up a current keyboard doesn't really get the job done. Third-party keyboards are coming, too, as we know Swiftkey already has one in the works. This looks a lot like what we've got in Gingerbread, actually. Though going by a screen shot hardly will do it justice. After you've selected text, you can choose an action from the (you guessed it) Action Bar. We're getting reworked "standard apps" (often called Google apps or Gapps) in Honeycomb. 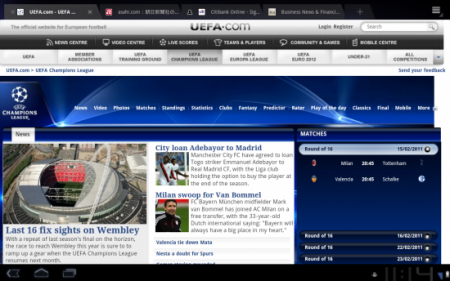 The browser switches to tabbed browsing instead of windows. There's also an "incognito" mode (borrowing from Chrome). You can automatically sign into Google sites, and sync bookmarks with Google Chrome on your desktop. 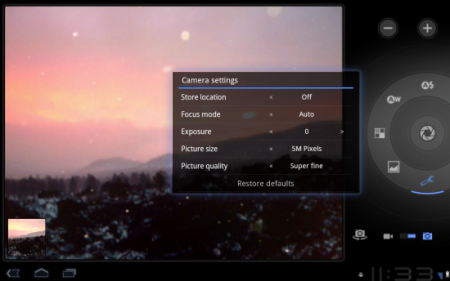 The camera app has been redesigned for larger screen sizes. You get quicker access to settings such as zoom, focus, flash, exposure, etc. Frankly, those are improvements that we should have in Android 2.2. Let's hope that gets ported over post haste. The stock e-mail app is getting quite the makeover. And we presume the gmail app (which you see here) gets it, too. 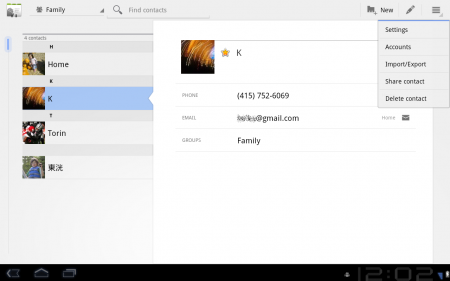 Like contacts, it'll take advantage of the dual-pane UI. You'll also be able to select multiple messages and act on them, tell attachments to sync at a later time, or use an e-mail widget. And -- this is our favorite -- you'll be able to drag and drop items, like you see in the image above. 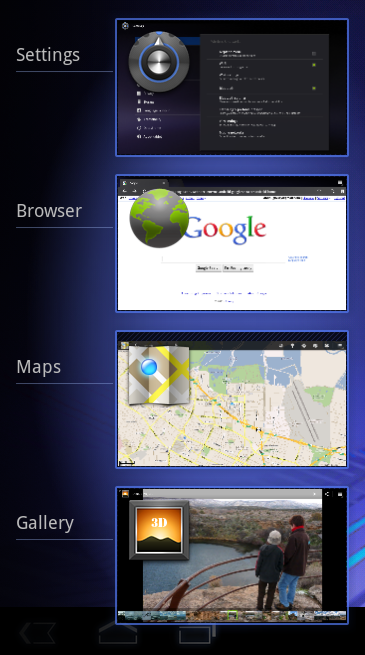 That's new in the Android 3.0 framework and can be used in various apps. What's on the screen is just as important as the technology driving it. And in Android 3.0, the graphics get a major boost. Open GL hardware acceleration has arrived for 2D graphics. And for 3D graphics, there's a special renderscript that serves as an API for 3D scenes, as well as a universal shader language. That's nerdspeak for "It'll look good and be fast." This is a big one, as dual-core processors have finally arrived. But, strangely enough, Android hasn't had true support for them until Honeycomb. And Google says that applications that are only written to take advantage of one core still can benefit from the change. Widgets are getting bigger and better. You can flip through 3D stacks, have grids or lists. 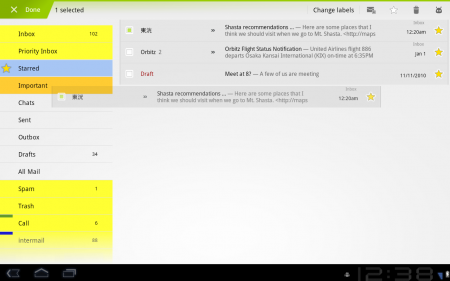 You can also interact with widgets in new ways, including scrolling and flipping the items within a widget. There's also a new DRM -- digital rights management -- framework. That's the thing you hear about when the record labels and other publishers accuse you of stealing their work. There also are new stereo Bluetooth profiles, so apps will be able to better interact with your accessories. This has been a big headache for a lot of you, we know. We'll just crip from Google here and tell you that "developers of device administration applications can support new types of policies, including policies for encrypted storage, password expiration, password history, and password complex characters required." The good news: Android 3.0 is fully compatible with current Android applications. That's not to say you won't see updates for Honeycomb, but your favorite app should at least be functional even if the dev doesn't touch it. So those are the broad strokes of Android 3.0. The APIs could still change. Features may be added or removed. We'll updated this post as necessary. But in the meantime, sit back, relax, and enjoy the preview Google gave us at the beginning of January.